I try some copycat recipes sometimes and this one is inspired from Zoe's Kitchen. Potato salad can make a nice side dish but I don't like the ones that have too much mayonnaise. I saw this grilled version on the menu and thought I had to try it. Looking and tasting the version I was served at Zoe's resulted in a fairly good version, but not an identical knockoff. I sauteed onions and garlic then added cubed cooked Yukon Gold potatoes. A little bit of salt, pepper and rosemary mixed in gently. Then I tossed in 2 fat tablespoons of butter. 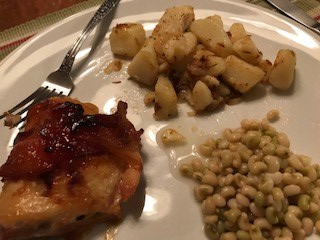 We served this hot potato salad with Bacon Wrapped Peach Chicken and I ought to have placed the meat on top of the potatoes, as it was served at Zoe's. It may have made a difference if it were boneless chicken but still....a nice accompaniment. Next time I need to add green onions, that would be pretty and I love the taste of those onions. As I have been doing a few copycat recipes over the years I am thinking of making a tab at the top dedicated to those recipes. 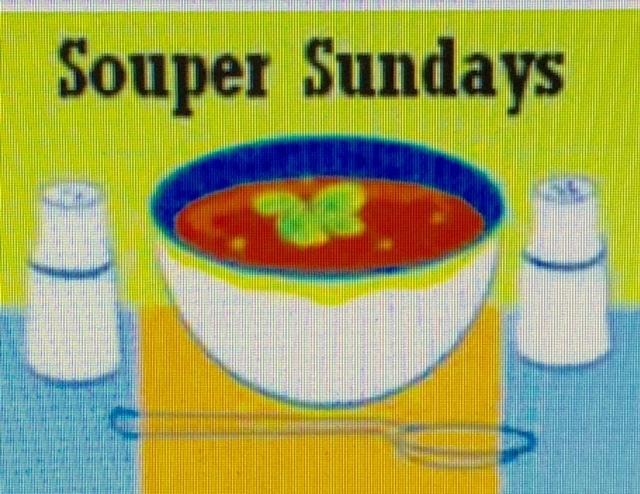 Linking up with Deb at Kahakai Kitchen for Souper Sunday this week. Check out her yummy Chickpea and Pasta soup post HERE. Zoe's is one of those places we used to go to all the time and then for whatever reason it fell off the radar. I miss their hummus! The potato salad looks really good and it looks the kind my husband would like. He's picky about potato salad and doesn't like the kinds with mayonnaise at all but loves the warm seasoned kind. I've never heard of Zoe's Kitchen until reading this post but I googled it and see there are a few near me (within 50 miles). I might take a trip to one soon. That recipe looks good. I had a roasted potato salad recipe once -- it's a great idea. I should do it again, following your great idea.